m a y f i l e s . . .: Almond Milk...What am I, Nuts? 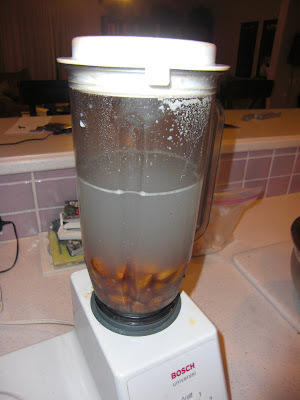 Soak 2 cups of almonds for 48 hours in spring water (or as pure as you have access to) I like to change the water a few times...it gets kind of grimy. Also I store all my nuts in the freezer and they last forever. Pour almonds into blender. Add 6 cups fresh water. I do it in 2 batches as I am not yet blessed with a large vitamixer. I love my bosch and it does the trick. Blend for a couple minutes until smooth. 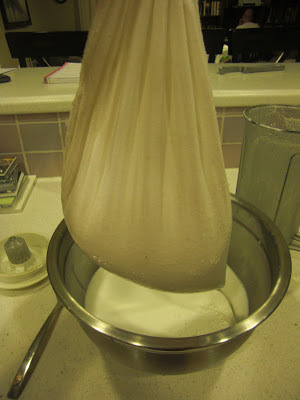 Pour into a cotton bag. This is one is organic cotton I bought from my seminar. It would have been a piece of cake to make too. But for a few dollars I bought it. 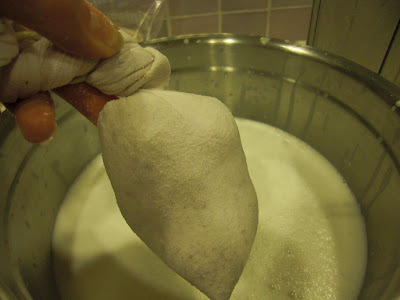 Squeeze milk out into bowl until only pulp is left. Save the pulp in the freezer for toppings and other treats or crackers. Some people like to add salt and a sweetener like agave. I decided we like ours plain. This tastes delicious on our multigrain hot cereal and in smoothies. 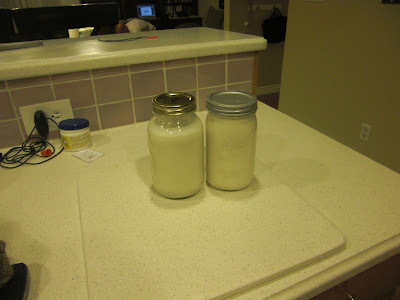 It makes 2 quarts, and we have found it to be the perfect amount for our family for a week. Give it a shot. Think of it this way. Why do we humans insist on nursing from a cow? Cows milk is designed to turn a tiny calf into a 1 ton heffer in mere months. Is that really what you want? Heffer in months? On a personal note...this is close to my heart because of the struggle with Ellery and Emmett. I don't remember if I have posted this before but to the best of our research and years of investigations with countless doctors, we believe they have a genetic condition called primary ciliary dyskinesia. Basically the cilia in their body is malformed and cannot move mucous through. The symptoms this would explain include the struggles they had at birth, the constant, unchanging, never ending flow of mucous from all possible outlets, the ears, the constant, unchanging, bronchitis cough...just to name a few. It hangs over me to try and rid their little bodies of as much mucous as possible, since they can't do so themselves. However to cleanse the body of all the excess requires a raw, vegan diet. Sigh...this is a huge hat to put on small children. I'm not sure where I am being led yet. what the? just buy a gallon of milk becc. Man we drink loads of milk in our family... so far no heffers, but Trev's not too far behind :). Good luck with that almond milk! Wahoo Rebecca, I finally made the almond milk. I've wanted to for many years but I just never dared to. I used to use soy milk until I found out how soybeans are treated and I also started having alot of premenapause symptoms. I love swiss oats which just soaks oats in milk overnight then add fruit. I now can have it again with the almond milk. thanks!